During the NFL off-season, most players spend time vacationing with their families, participating in charity golf tournaments, and renegotiating contracts. 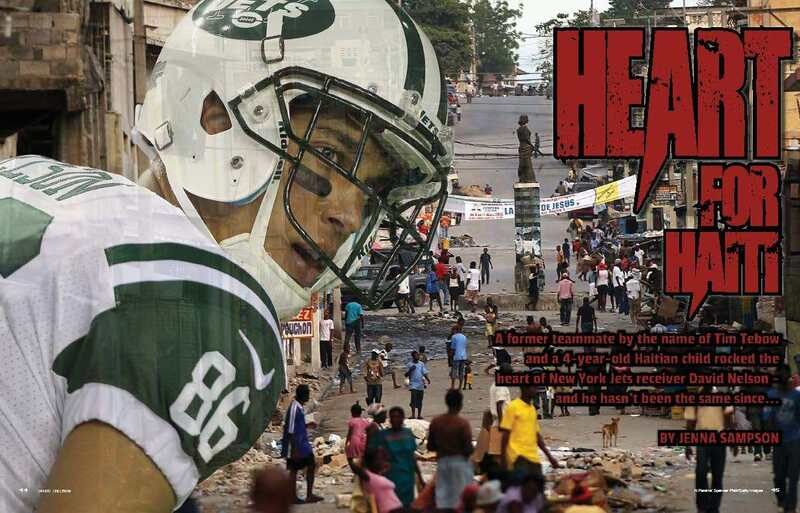 New York Jets wide receiver David Nelson does something a little different during his time away from the gridiron. In fact, a lot different! After a life changing missions trip to Haiti in the spring of 2012, Nelson and his two brothers founded the orphan ministry I’m Me. The organization is raising up a generation of fatherless children to find their true identity in Christ, in the midst of a third world country suffering from destruction and hopelessness. He spends up to two months of the offseason in Haiti, and most of his free time stateside is spent running the organization, networking, speaking, and planning group trips. His commitment to I’m Me is clearly important, but it doesn’t overshadow what the 6-5 receiver is doing on the football field. Nelson grew up playing football in the Lone Star State, and went on to play college ball at Florida with legendary quarterback Tim Tebow. In fact, it was Nelson that caught Tebow’s infamous jump pass in the end zone to win the 2009 BCS championship. And while Nelson claims he was a surface Christian until that 2012 trip to Haiti, there is no doubt in his mind that Tebow helped water that seed of faith growing inside of his heart during his time at Florida. Tebow continued to encourage him in his walk with the Lord. “It was never one of those things where Tim said, ‘hey you’re not living right,’ it was like, ‘I see something in you, I believe in you,’” he shares. “I thought it was annoying. I was so consumed with myself and what I wanted. When he said he believed in me, it struck my heart, but on the outside, my brain was saying, ‘I don’t want that yet.’ But that seed that he watered, blossomed during that Haiti trip in 2012.” During the trip, Nelson had a true heart change and internal transformation, and in his words, it was something straight out of Philippians 3:7: But whatever were gains to me I now consider loss for the sake of Christ. 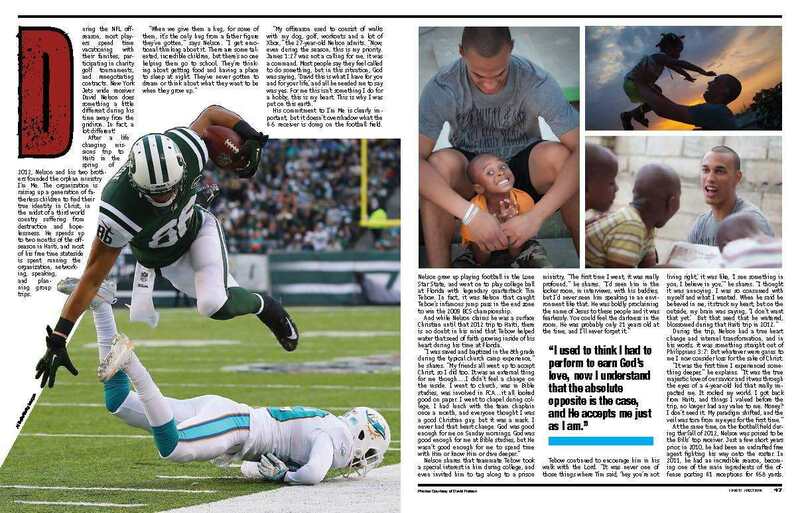 At the same time, on the football field during the fall of 2012, Nelson was poised to be the Bills’ top receiver. 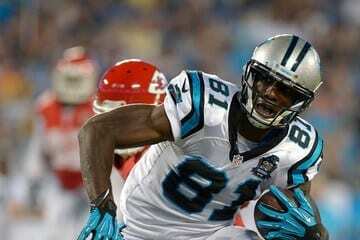 Just a few short years prior, in 2010, he had been an undrafted free agent fighting his way onto the roster. In 2011, he had an incredible season, becoming one of the main ingredients of the offense posting 61 receptions for 658 yards. But everything came to a screeching halt during that first game of the 2012 season when he tore his ACL. It proved to be the biggest valley of his sports career. But Nelson made it back onto the field, and while he was cut by the Browns during the 2013 preseason, teams started calling, and he eventually settled onto the Jets roster. He scrambled to make up for lost time, and ended up returning to his pre-injury form by the end of the season, posting 423 yards. “I wanted to pay [GM John Idzik and Rex Ryan] back for their belief in me, and for taking a chance on a player when not many other teams were,” he said at the time. 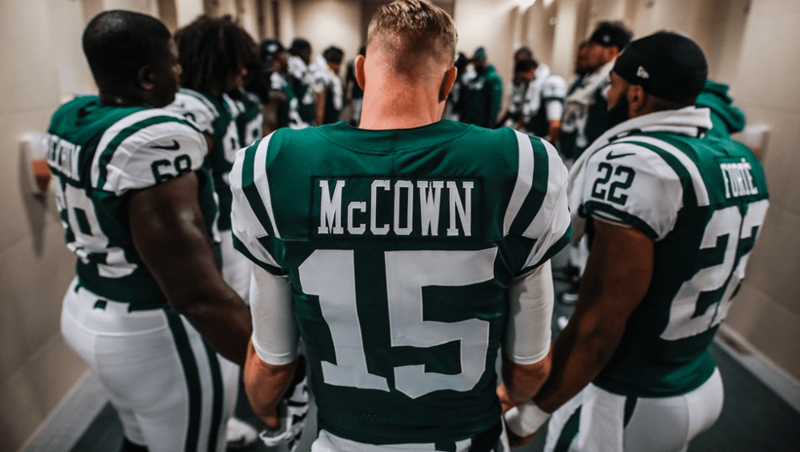 This time around, his two-year contract with the Jets is affording him the opportunity to have a full 2014 offseason with the Jets’ coaching staff and QB Geno Smith. And at the pace Nelson reached at the end of last season, there’s no doubt he’ll be ready to take the field this fall, make Jets fans proud, and continue to change lives in Haiti! Jenna Sampson is a contributor to Sports Spectrum magazine. This story is published in Sports Spectrum’s Summer 2014 print issue. Subscriber? Log in here to view the issue or subscribe here to receive 12 issues a year.